Ten years ago, China Vanke was the first Chinese real estate enterprise to release a social responsibility report. 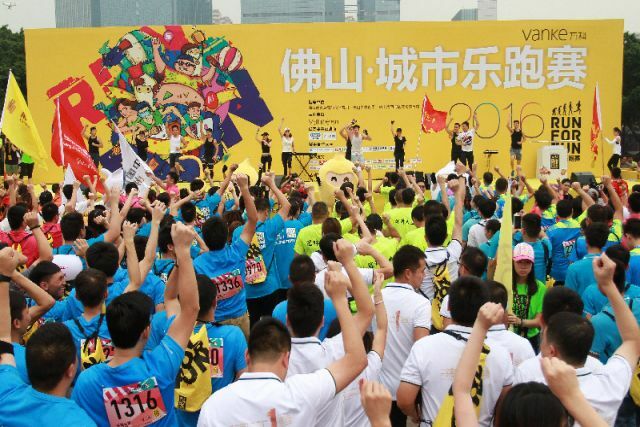 Today, Vanke continues to demonstrate unwavering philanthropic efforts and enrich lives around the globe based on their philosophy “Empowering Life, Enlightening Cities”. 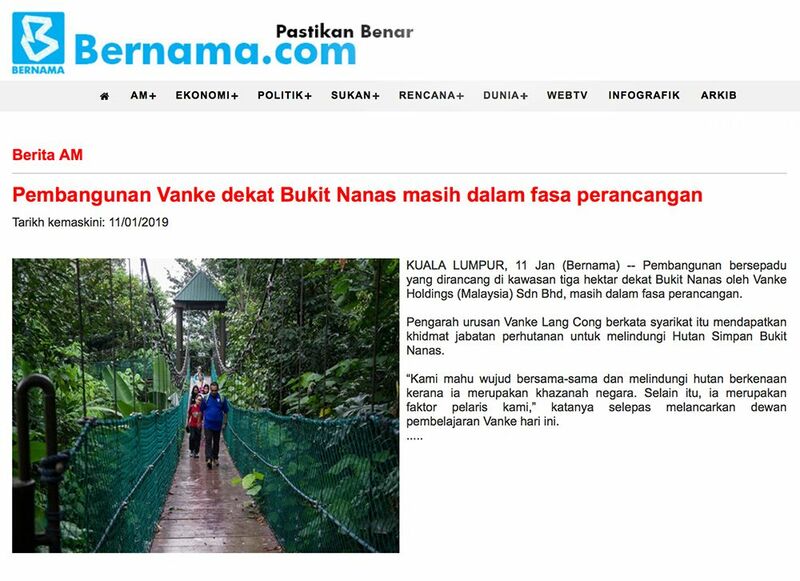 Kuala Lumpur, 12 April 2019 – Vanke Malaysia expanded its environmental footprint this morning with the launch of their Hutan Simpan Bukit Nanas Conservation Project. 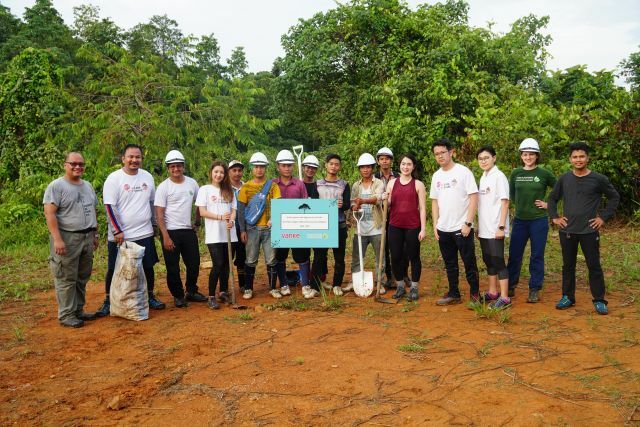 In collaboration with EcoKnights, the Forestry Department Peninsular Malaysia and Taman Eko Rimba Kuala Lumpur, Vanke Malaysia organized a tree-planting initiative at Taman Eko Rimba. 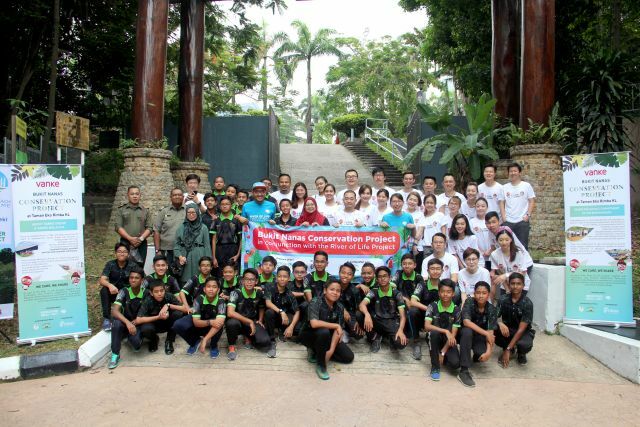 The Bukit Nanas Conservation Project was officiated by the Deputy Director of Forestry Department Kuala Lumpur, Mariatul Qiptiyah binti Md Sah. A total of 30 fruit trees were planted by 28 student volunteers from Sekolah Menengah Sains Alam Shah (SMSAS), Vanke Malaysia’s employees and EcoKnights volunteers. The Taman Eko Rimba staff will assist in regular inspection and caring of the planted trees to ensure their steady growth. After the tree-planting session, the students took part in an Eco-Enzyme workshop where they learnt to reuse plant-based kitchen waste such as fruit skins and leafy vegetables to create a cleaning agent through a fermentation process using brown sugar and water. This initiative inspired students to support the cause of sustainable living and to work towards learning to create a chemical-free household. Vanke’s commitment to environment conservation and sustainability is in line with one of its key corporate social responsibility (CSR) pillars. 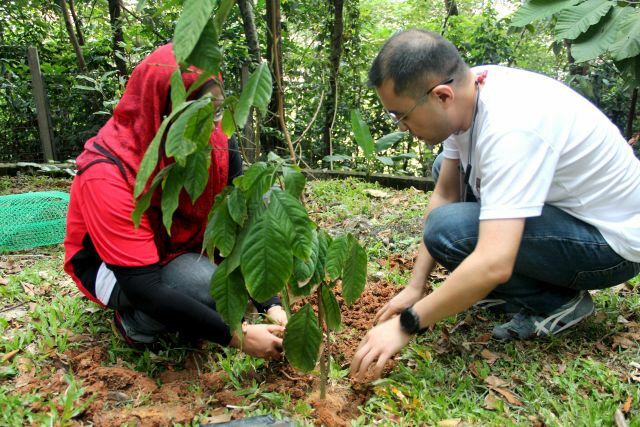 Through environmental protection initiatives which include forest restoration projects in degraded forests, focusing on canopy restoration, improving water catchment and linkage areas by planting varying forest tree species, Vanke Malaysia seeks to give back in a way that is as green as possible. Giving our time to those in need is our way of giving back. Spending a day at Praise Emmanuel Children’s Home has given us a place to leave a lasting and positive impact in the children’s lives. Education and growth of adolescents have always been Vanke’s top priority, especially in poverty-stricken areas. Donating to building schools, promoting fruits of education reforms and awarding excellent talents have spread knowledge to more children. 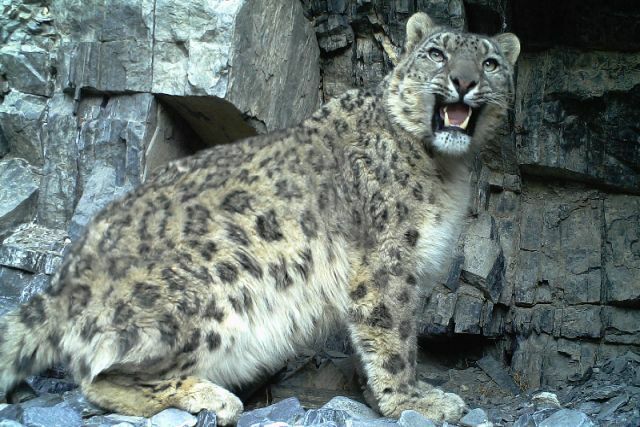 Vanke Foundation has launched its research and protection of snow leopards and their habitat in Tibet’s Qomolangma Conservancy Area. 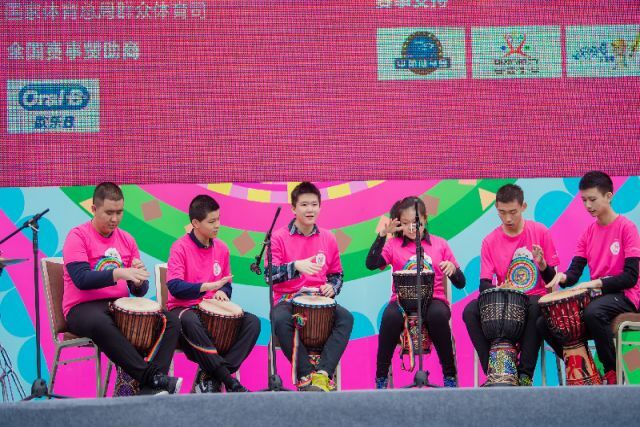 Vanke has worked with all segments of society to launch special help, rescue and support actions for special children’s groups to allow them to grow up healthily and happily. 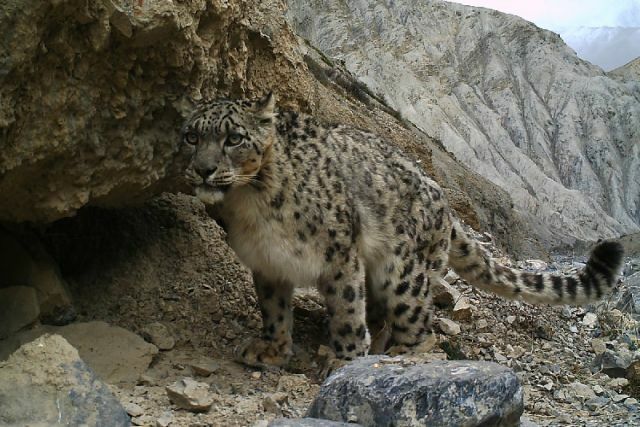 Such efforts are to offer professional medical care and assistance in remote areas. 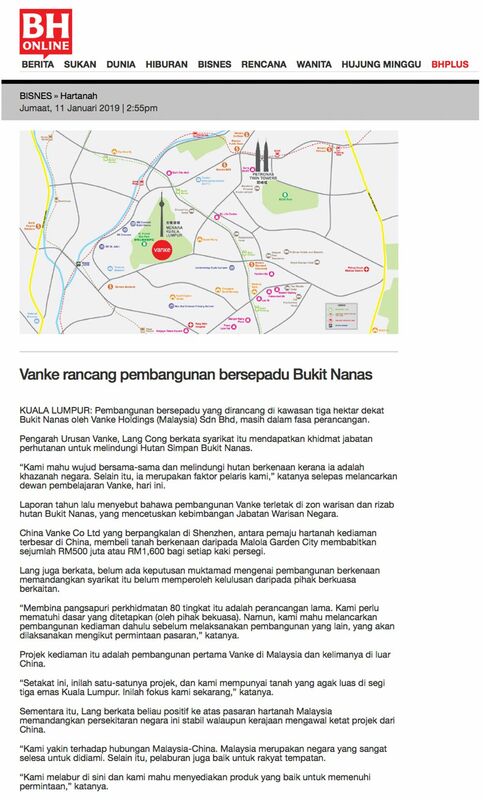 Kuala Lumpur, 7 March – Vanke Group today officially launches the Vanke Experiential Hall (VEH) in Kuala Lumpur, Malaysia. 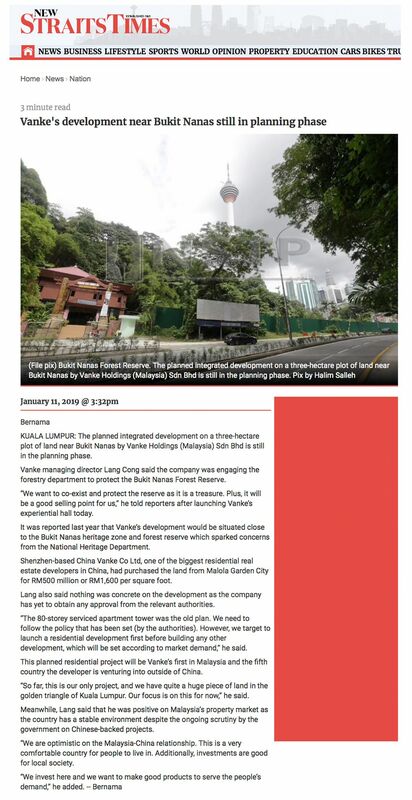 Located in Menara IMC, right in the heart of Kuala Lumpur’s Golden Triangle, the VEH takes visitors through an engaging and educational gallery, showcasing the Group’s journey from its humble beginnings to its notable international success stories. Officiated by YB Tuan Haji Khalid Abd. 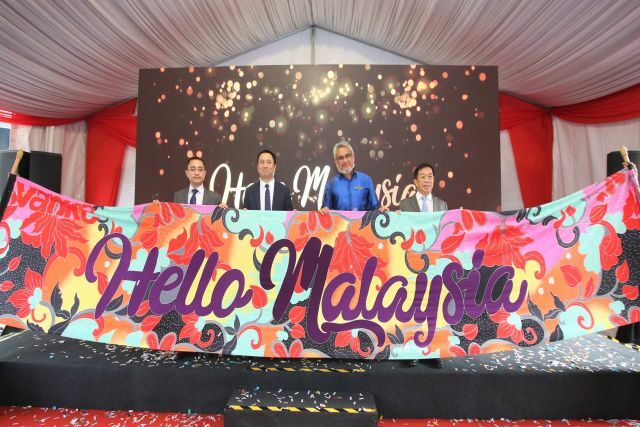 Samad, Federal Territories Minister and Mr. Wang Haiwu, Senior Vice President of Vanke Group, the launch ceremony showcased the “Hello Malaysia” video to signify the spirit of the Malaysian Batik and the culturally similar traits of Vanke - Customers as priority, the unwavering spirit of craftsmanship and the commitment for quality to create a better life. A plaque signing ceremony was also held as part of the officiation ceremony by the Federal Territories Minister. 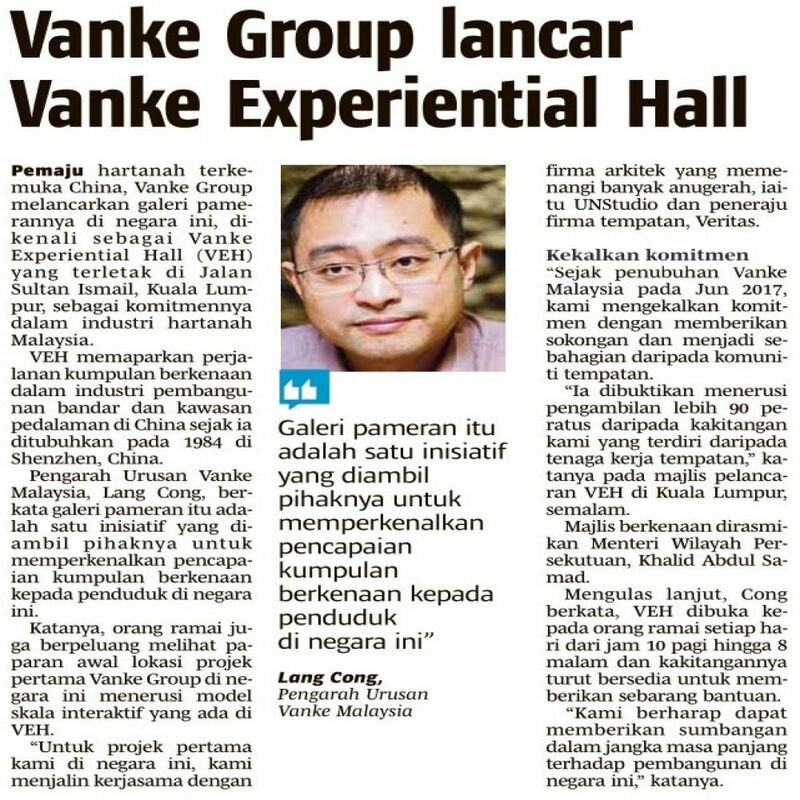 “The Vanke Experiential Hall is an initiative close to our hearts as it is Vanke Malaysia’s first introduction to Malaysians. 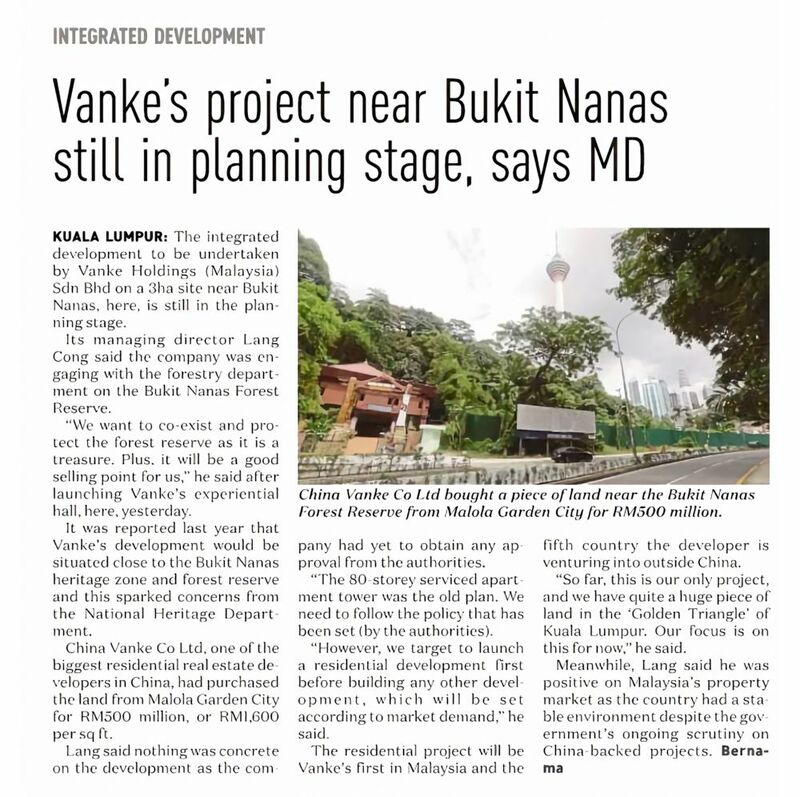 We hope to contribute long-term alongside Malaysia’s development and help build high quality living spaces that would enrich lifestyles for Malaysians,” said Lang Cong, Managing Director of Vanke Malaysia. As Vanke Malaysia is working collectively towards their mission of bringing communities together, supported by innovation and sustainability, visitors visiting the Vanke Experiential Hall will discover Vanke’s solutions in the fields of innovation and sustainability as well as learn more about the initiatives with local organisations such as Tropical Rainforest Conservation & Research Centre, EcoKnights, Loka Made and Biji-Biji Initiative. 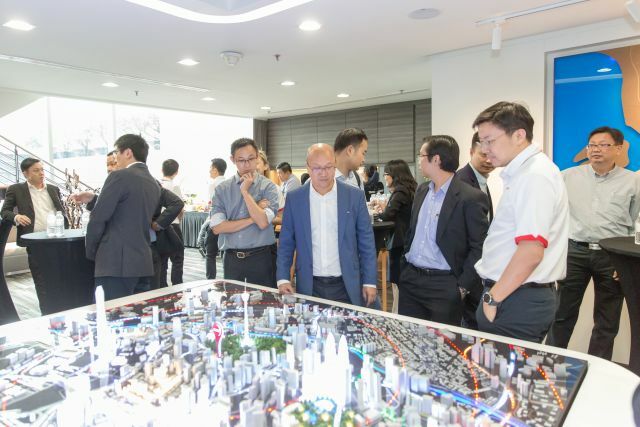 Visitors will also get a sneak preview of Vanke’s inaugural project’s location through an interactive scale model. 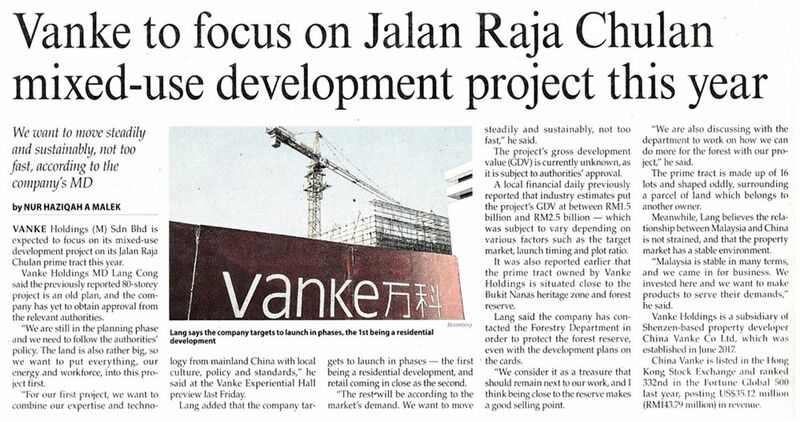 Vanke Malaysia is working with award-winning architect firm, UNStudio and leading local firm, Veritas on the project. 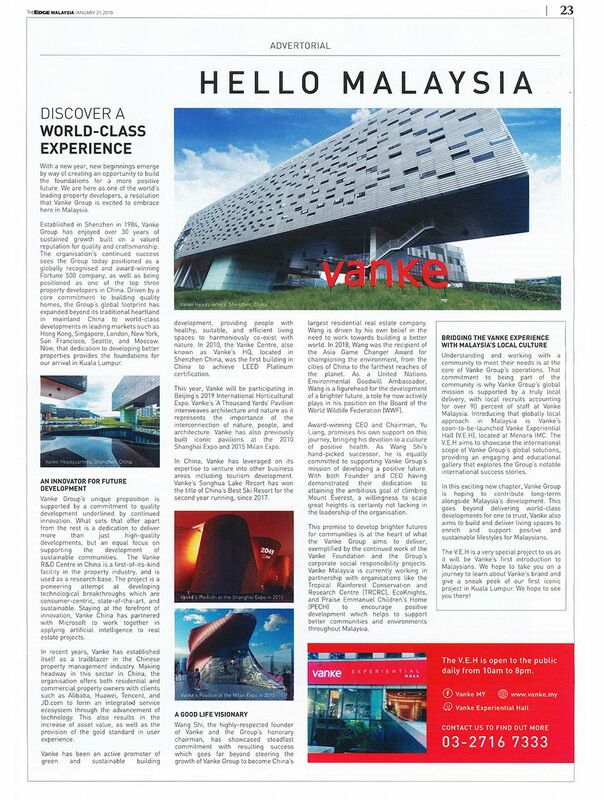 The Vanke Experiential Hall is open daily to the public from 10am to 8pm with regular guided tours for all visitors. 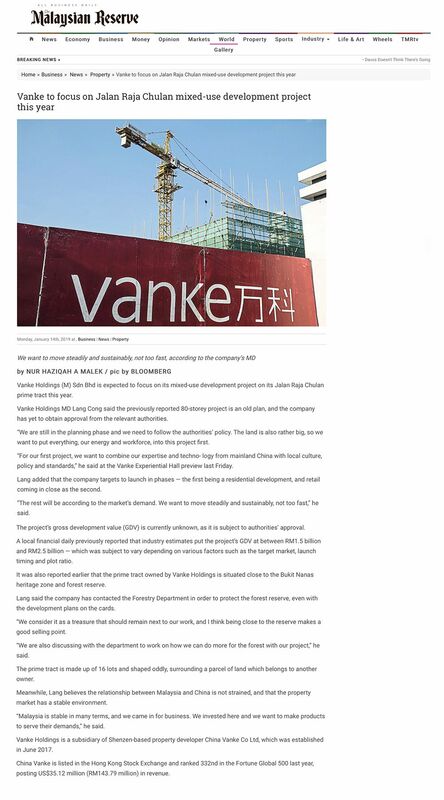 As one of the world’s largest real-estate companies, Vanke has a long-standing commitment of good governance in all our business practices and decision making. 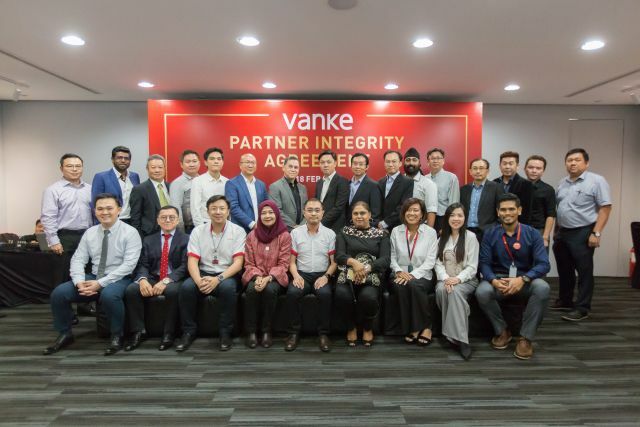 On Monday, 18 February 2019, Vanke Malaysia and our business partners gathered at the Vanke Experiential Hall to jointly sign Vanke’s Partner Integrity Agreement, to demonstrate both parties’ joint commitments towards transparency, honesty and accountability. The Vanke Partnership Integrity Agreement sets the foundations of good governance for both Vanke and our partners in all their business operations, highlighting a mutual understanding on the stance of zero tolerance against corruption. 16 of Vanke’s business partners who have participated in the signing ceremony signifies an important step towards a transparent partnership. 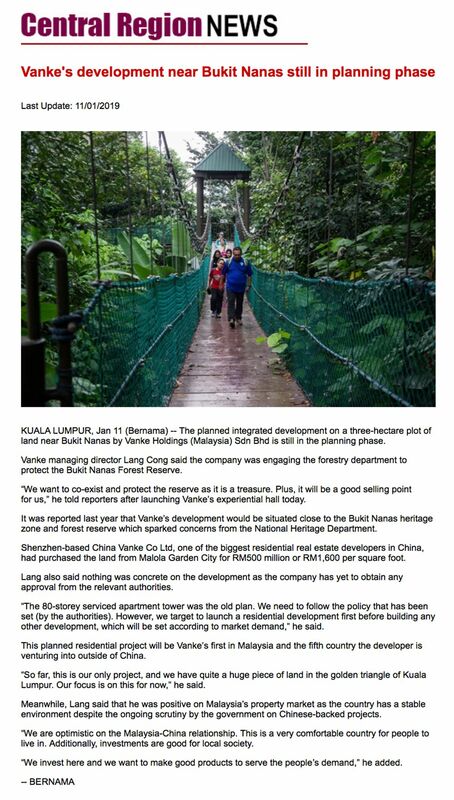 Vanke Malaysia’s partnership with Tropical Rainforest Conservation and Research Centre’s (TRCRC) aims to support forest restoration initiatives in degraded forests, focusing on canopy restoration, improving water catchment and linkage areas using 6 forest tree species, as well as planting over 200 trees. This jungle excursion gave volunteers from Vanke Malaysia volunteers the opportunity to experience some of the day-to-day restoration work as carried out by TRCRC’s trusted environment specialists. Lahad Datu, Merisuli, a remote forest reserves area under the Sabah State Forestry Department was where the jungle excursion took place. Volunteers gained insights on the process, ranging from seed collection to nurturing endangered species into saplings before they can be introduced into deforested plots. The Tropical Rainforest Living Collection nursery created by TRCRC is home to many endangered saplings. During this trip, 30 mature saplings from the nursery were transferred to the ground and planted by our volunteers.Other activities during the trip included cave exploration as well as wildlife searching. 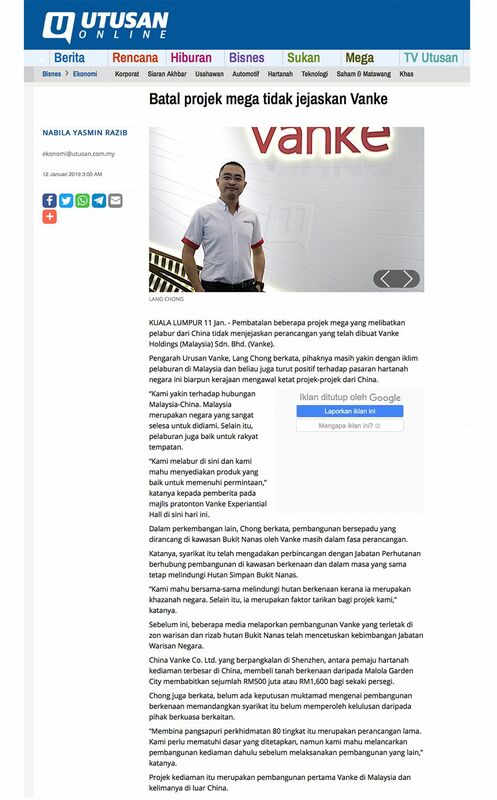 As environment conservation is a key CSR pillar for the Vanke Foundation in China, Vanke Malaysia aims to promote to emulate our efforts here in Malaysia. 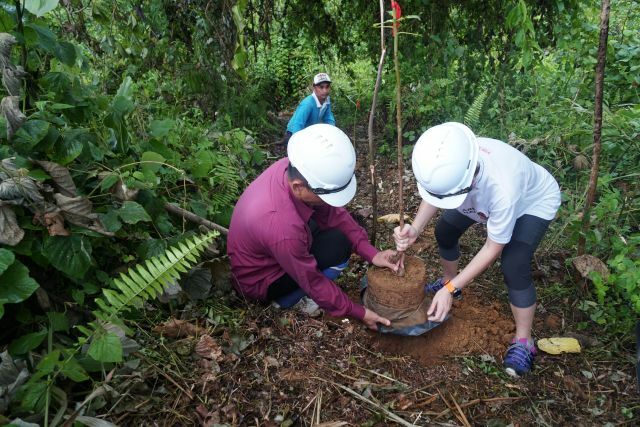 Vanke Malaysia has since partnered with EcoKnights on a long-term basis to initiate tree planting activities, to plant over 100 trees under the River of Life programme. 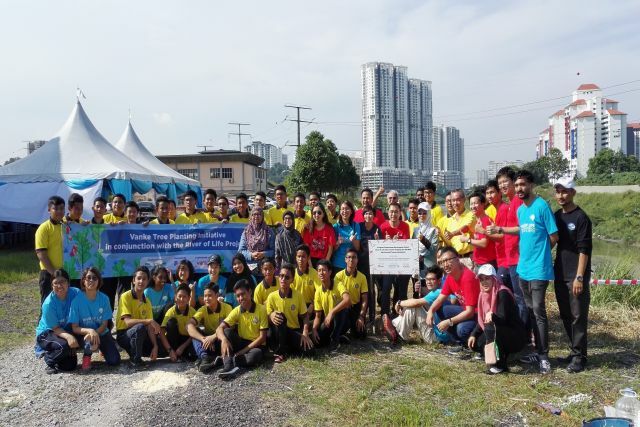 EcoKnights, Vanke Malaysia, and students from Sekolah Menengah Sains Alam Shah came together to plant 20 trees at Taman Halimahton, along the Klang River. The trees were planted to make the area greener and more attractive for recreational purposes. 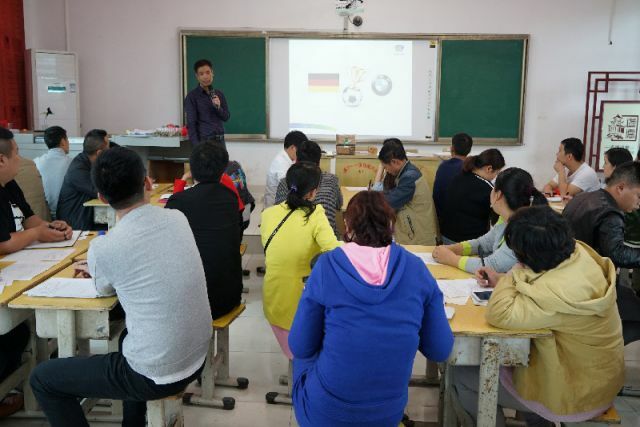 After the tree planting session, a mud ball workshop was conducted, to teach volunteers and students an organic method of improving the quality of rivers. 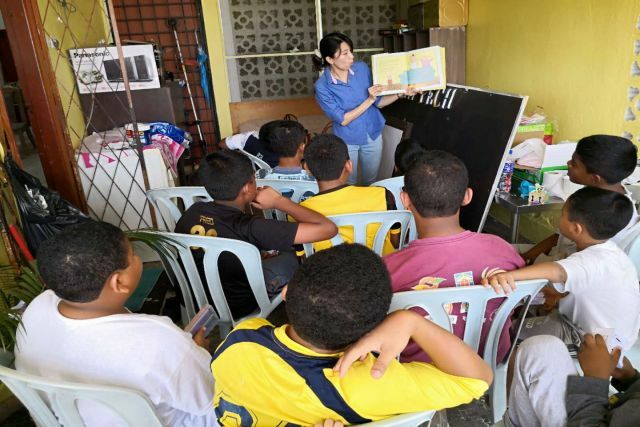 Committed to the continuation of the “What is your Wish” campaign, Vanke Malaysia teamed up with Project Heart, a not-for-profit organization with a mission to empower and educate underprivileged children. 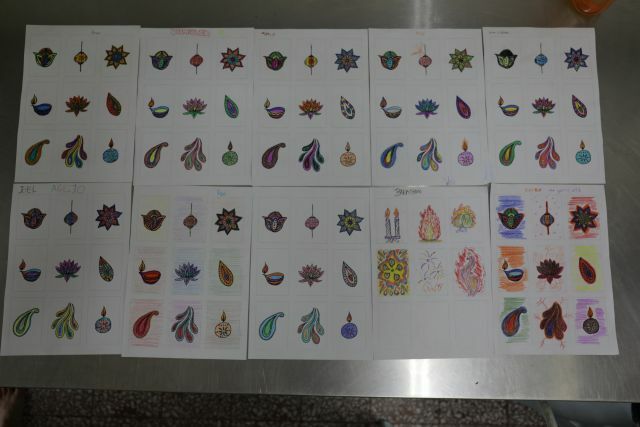 For this installment, with Deepavali just around the corner, we provided colouring and drawing templates for 12 children to showcase their artistic skills and create festive Deepavali cards. Inspired by this visit, our engagement with these children will not stop here. Further programmes will be instilled with the aim of creating conducive learning environments, designed to allow the children to leverage and upskill their respective skillsets. 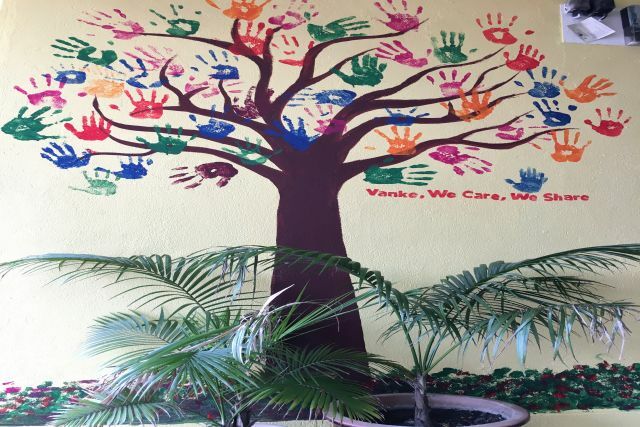 The Vanke team returns to Praise Emmanuel Children’s Home (PECH) to complete the painting of the home’s interior. Arts & crafts activities were simultaneously carried out as an extension of Vanke’s “What is Your Wish” campaign. The activities with the children were designed to spur creativity, and instill a passion for art in both the children, and volunteers! 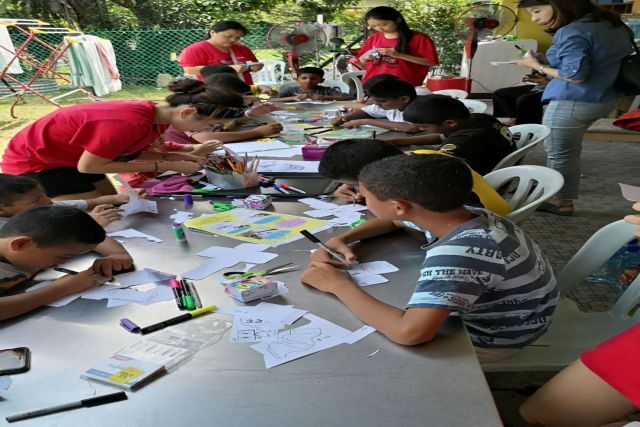 Our volunteers planned a fun-filled afternoon of arts and crafts. The day consisted of paper robot making, slime creation, baking soda snowman and the design of lava lamps. 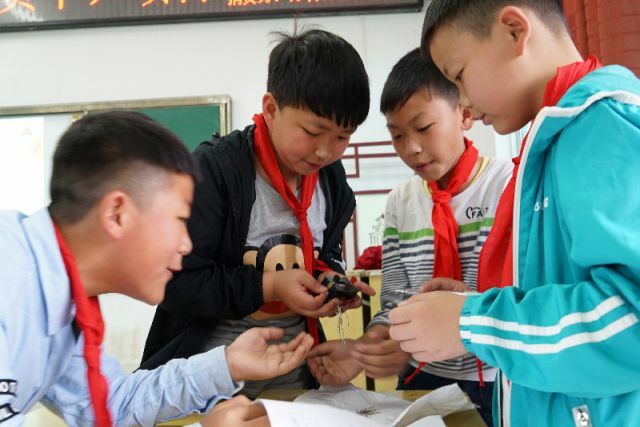 Our volunteers were touched by the children’s enthusiasm to learn.Vanke is proud to have been able to provide them with opportunities such as this one, allowing the kids to grow and chase their dreams. 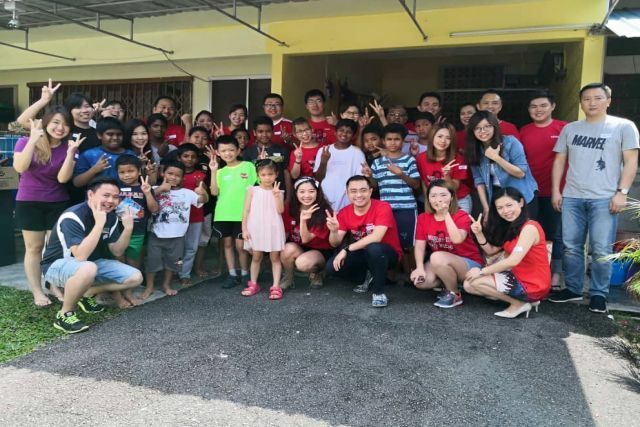 Today, Vanke Malaysia initiated its long-term collaboration with Praise Emmanuel Children’s Home(PECH) – a refuge for abandoned, abused and underprivileged children. Volunteers spent time getting to know the children, discussing their passions, dreams and hobbies. 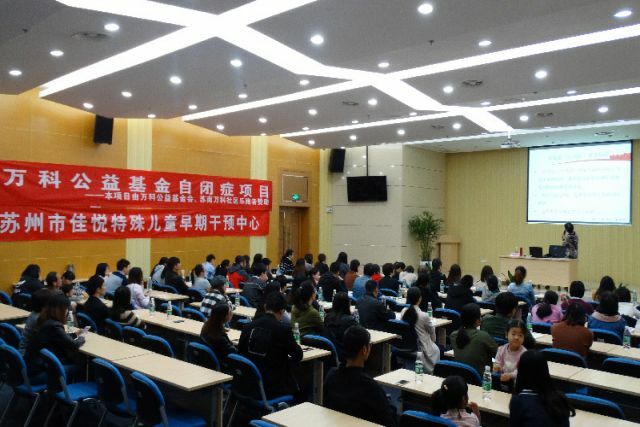 The visit commemorated the launch of Vanke’s “What is your Wish” campaign. “What is your Wish” campaign aims to empower underprivileged children through means of strengthening and developing their skillsets with tailormade activities to the children’s needs. Instead of direct monetary support, we believe in active involvement and alleviating the home’s burdens by contributing towards their day to day basic needs from food to some crucial household expenses. 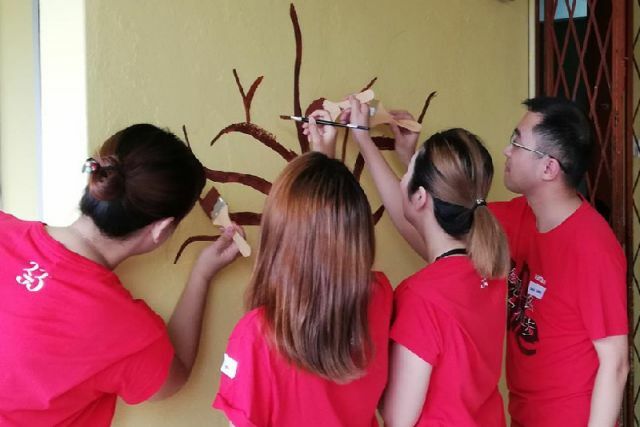 Highlight of the day – volunteers and the kids coming together to give the external walls of the home a fresh coat of paint, before capping the day off with a beautiful hand painted mural design. Smiles splashed across the faces of both the volunteers and children – who started the day as strangers, but left having learnt a little more about each other. In celebration of Children’s Day, we spent a day to refocus on important things and bond with each other’s families. 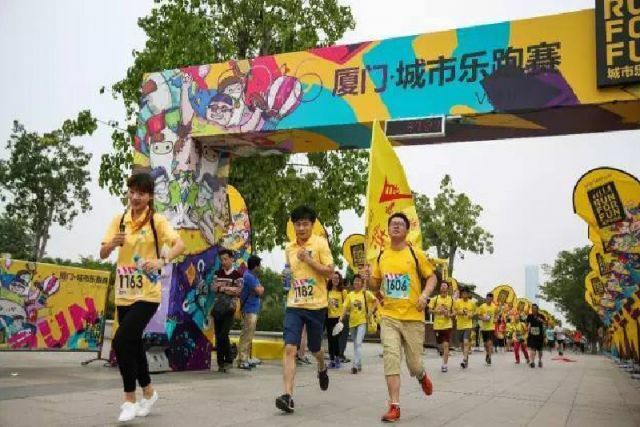 In line with our core value to “Create a Healthy and Enriched Life”, we have led the health movement in over 60 major cities and conveyed a healthy and joyful sports philosophy to the society through our successful convening of "Run for Fun" since 2013.